All the modern materials used in this lounger are 100% recyclable and the manufacturing processes used produce very little waste giving the whole thing an environmentally friendly. LUXOR DINING SETS There are 12 products. 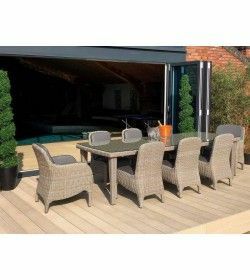 Our Luxor 6 chair dining set comprises of 4 x dining chairs 2 x dining armchairs and 1 x dining table, opulence and beauty, with all the class you can imagine from this luxury range of outdoor garden furniture. Our Luxor 8 chair dining set comprises of 6 x dining chairs 2 x dining armchairs and 1 x dining table, opulence and beauty, with all the class you can imagine from this luxury range of outdoor garden furniture. Palm Dining Set ... The table has a reversible top … Style up your outdoor space today with a luxor Palm Dining set. 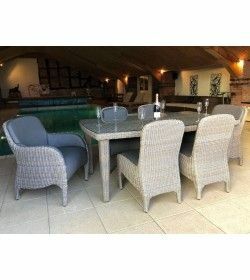 You get a 3 year guarantee on the Frame & Weave and a 2 year guarantee on the FabricsSet includes: 1 x Round Dining Table with reversible top, 4 x Living Armchairs. Set includes: 6 X London Armchairs & 1 x Vernazza Table. 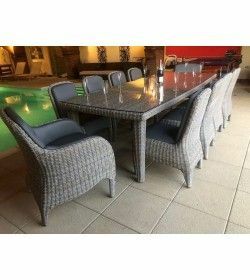 Dining Set … Contemporary with minimalist proportions … It uses the classic combination of synthetic leather with eye catching outdoor rattan in a hugely contemporary design that will add chic appeal to both commercial and domestic spaces. Set Includes 1 x 2.75 metre Dining Table, 2 x Meteor Armchairs and 8 x Meteor Dining Chairs. The Meteor Range includes a 3 year guarantee on the Frame and AbacoXF Weave and a 2 year guarantee on the Ultra Hi-Loft Fabrics. Set Includes 1 x 1.9 metre Dining Table, 2 x Meteor Armchairs and 4 x Meteor Dining Chairs. The Meteor Range includes a 3 year guarantee on the Frame and AbacoXF Weave and a 2 year guarantee on the Ultra Hi-Loft Fabrics. A very luxury dining experience. All frames are made from tough but lightweight aluminium making them great for use outdoors. Set Includes 1 x 2.75 metre Dining Table, 2 x Meteor Armchairs and 6 x Meteor Dining Chairs. The Meteor Range includes a 3 year guarantee on the Frame and AbacoXF Weave and a 2 year guarantee on the Ultra Hi-Loft Fabrics. A very luxury dining experience.